"Now, there's a body in the rose bushes. Is that gonna be a problem?" Death sighed. "Right now there's just too big a window of opportunity. We know the forgery was made sometime after 1970. Probably after '74. It could have been switched at any time since then, so more than four decades we have to account for." Item #1: An Old Family Feud. Item #2: A Missing Woman. Auctioneer Wren Morgan and her private eye fiancé Death (pronounced "Deeth") Bogart are ready to meet each other's parents and settle down together. But their sleuthing days are far from over. While Death and Wren are helping prepare auction items at an old supper club, a Viking reenactor nearly dies at the historical settlement next door. The cause? Seeing the ghost of his daughter, who went missing twenty years ago. 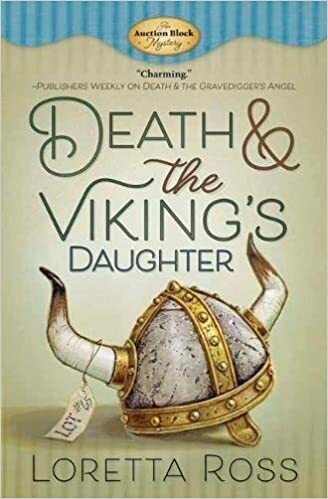 As Wren looks into what happened to the Viking's daughter, Death is hired to investigate the theft of historical items that have high sentimental value. When their respective investigations turn out to be connected, the couple gets caught in a deadly conflict. Sounds really good. I'll have to look into it. My Teaser is from an urban fantasy title.